It's So Easy Being Green: Make your own... Sweatbands! A couple weeks ago, someone had the audacity to steal my gym bag out of my car. I actually can't complain too much because the lock on my passenger door has been broken for months, and I've neglected to fix it. You could say I have a lackadaisical approach to non-essential car maintenance, so it was just a matter of time until someone benefited from my laziness. Luckily, my running shoes weren't in the bag, so said person made off with some pretty valuable booty: an old sports bra, sweat pants, and t-shirt that had been demoted to the exercise wardrobe. Annoying that I'm down one rotation of workout gear BUT, the worst part of the incident is that they got my headband. Now, THAT pisses me off. I've only been a serious exerciser for about a year, but I've learned a couple important things since then: A) I am a much happier person after a good run, and B) I sweat profusely and am miserable without a headband. The ladies with long hair know what I'm talking about here. Nothing ruins a good workout like your sweat acting as an adhesive between your bangs and forehead. The point is, the headband--yes, I only had one--was exceedingly valuable and I needed to replace it immediately. I realized that instead of a headband, what I really needed was a sweatband that does double duty--keeps the hair back and absorbs the sweat. Just as I was about to dash off to American Apparel and pony up $8 for a piece of fabric that had been given the "cool" stamp of approval, I thought better of it. The headband/sweatband is such a basic shape that surely, I had something that could do double duty. That's right, it was time for a little DIY fun, folks! (For those readers not in their 20's, DIY is hipster-short for old-fashioned "do it yourself". The term has gained mainstream popularity in the last few years--there's even a DIY network and a magazine (Ready Made).) Since we are so completely dependent on huge corporations for the majority of the "things" in our lives these days, the idea of refashioning and repurposing--doing anything yourself instead of buying it--is a radical act. And of course, when we reuse something we already own instead of buying a new product, we avoid using up more resources and energy. Read more about DIY culture gone mainstream on Wikipedia. Turns out I had several headbands just waiting to be cut out of the waistbands of old tights. 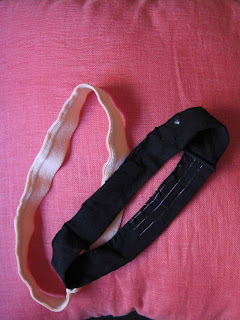 This has to be the easiest DIY project ever: Cut the waistband out and, voila, you have a semi-absorbent headband. 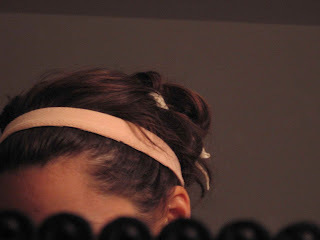 Since mine were ballet tights that I'd been carting around for, oh, 10 years, my headbands are now black and ballet pink. I'm the least crafty person EVER, but this tiny accomplishment has inspired me to scour my closet for any bits of clothing that can be repurposed to a better use. Second discovery: scraps of cut-off t-shirt necks give a boring ponytail pizazz! Also, I've declared the next few weeks "Make do with what I have month", as I'm attempting to spend as little money as possible before my sabbatical. It's interesting how creative you can get out of necessity. Next step: Make potholders out of the rest of the nylons, like my sister and I did as kids, and deplete all the food in my kitchen before I buy more. Oh, and among its varied headband offerings, American Apparel is selling a style that is undoubtedly the cut-out waistbands of tights for $3.50. UPDATE 6/9--Ok, now this is a real coincidence. What are the chances that within a couple days, I happen upon two totally distinct styles of DIY sweatbands?! So I was cutting a pair of old sweatpants into summer running shorts, and as I trimmed them down to get the right leg length, noticed that I had two totally perfect ABSORBENT sweatbands!! Now, unlike the bands featured above (which I still totally heart, don't get me wrong), these can handle some heavy-duty sweat. Just make sure you use a thinner part of the sweatpant leg, such as the area close to the knee, so that the band fits tightly. 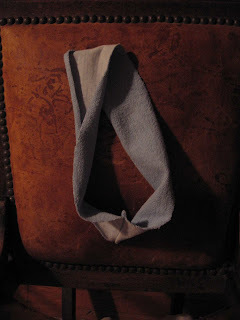 And, as tempting as it might be to have your very own unique sweatband, please don't take scissors to a perfectly good pair of sweatpants. Only use worn ones that don't serve full-leg coverage well anymore. And use the rest of the leg material for something else...I'm saving mine for some yet unforeseen purpose. I think I have enough sweatbands for now. Did you know that the term DIY has been around long before people in their 20s "invented" it? thanks for the input, anonymous. I didn't say that people in their 20's invented "DIY". Was just trying to give some older people who might not be familiar with the term (like my parents) a little context. Great idea! We are in the process of downsizing for our move so this will add some fun to an otherwise tedious chore of going through my closet. Love the post! Thanks for the inspiration. hi,I got variety of Sweatbands, Armbands and Headbands in different clours-plain sweatbands or custom printed sweatbands form WIZID_Australia. It’s unbelievable we can create our own Sweatbands online, they provided bulk discounts, delivery Australia wide. Incredible! This blog looks exactly like my old one! It's on a entirely different topic but it has pretty much the same page layout and design. Wonderful choice of colors! [url=http://www.cwstudio.it/fr/maillotdefootpascher/]Maillot de foot pas cher 2014 2015[/url] It is the best time to make some plans for the future and it is time to be happy. I've read this post and if I could I want to suggest you few interesting things or suggestions. Perhaps you can write next articles referring to this article. I desire to read even more things about it! [url=http://www.nastrificiodebernardi.com/images/maillot-de-foot-psg.html]maillot de foot psg[/url] Hi there, I do believe your blog might be having browser compatibility issues. Whenever I take a look at your website in Safari, it looks fine however, when opening in IE, it's got some overlapping issues. I just wanted to provide you with a quick heads up! Apart from that, excellent website!